Varsa Baalim was an Ayleidic city located in the Nibenay Basin of Cyrodiil, close to Lake Canulus on the foothills of the Valus Mountains. 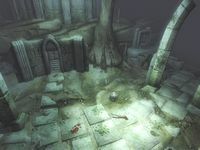 It was a great, ringed, labyrinthine city constructed during the height of Ayleid rule to guard the Nefarivigum, a foul construct of Mehrunes Dagon used to test pilgrims seeking Mehrunes Razor. For years, the elves drove back the many pilgrims who came for the evil artifact. However, in the early days of the First Era, a vampire managed to slip into the city unnoticed and turn the populace. Varsa Baalim was thrown into a gathering storm of madness and ruin, until it seemed that none were left to prevent the Razor from being recovered. Suddenly, the city was gone, when the mountains of the Eastern Niben swallowed Varsa Baalim and the Nefarivigum with it. Whether it was caused by a final fallback plan of the Ayleids, a natural cataclysm, or the touch of the Divines is unknown. For centuries the city remained hidden, entombed deep within the mountains, inhabited by the undead vampiric remnants of its populace. In 3E 433, a rogue Telvanni arch-mage named Frathen Drothan set out to use the Nefarivigum to recover Mehrunes Razor, which he could then use to overthrow the Empire. He gathered many mercenaries to his cause and formed the Drothmeri Army, which marched into Cyrodiil and captured Sundercliff Watch, an abandoned fort built during the rule of the Reman Dynasty. The fort had deep iron mines that extended far underground, and Drothan used these to excavate the entrance to Varsa Baalim. Once it was uncovered, he ventured into the ruins of the city with a large detachment of mercenaries and magically sealed the entrance to deter assassins. The vampires quickly fell upon the band, and Drothan fled, making his way to the Nefarivigum and leaving the scattered mercenaries to fight back the vampires. The Champion of Cyrodiil, hearing rumors of Drothan's rebel army, entered Sundercliff Watch, fought through the Drothmeri Army and broke the magical barrier preventing any from entering Varsa Baalim. The Champion traversed the ruins, where battle between the Drothmeri and the vampires still raged, and entered the Nefarivigum. The Champion then defeated Drothan and claimed the Razor.